Taylor's 300 Series has introduced countless players to the pleasures of the all-solid-wood acoustic experience; it's the entry point to Taylor's USA-made instrument line. Players who step up to a 300 Series instrument will be rewarded with a guitar-for-a-lifetime that will only sound better with age. The 300 Series has everything you need and nothing you don't need in a fantastic sounding and playing instrument. All 300 Series instruments ship in a deluxe hardshell case made by Taylor for optimal fit and protection. Taylor's Grand Concert is slightly smaller than the Grand Auditorium and yields controlled overtones, so the sound won't occupy a lot of sonic space. This is often a key consideration when other instruments are in the mix, such as in a performance or recording environment, and it allows the guitar to be heard more clearly. It's perfect for fingerstyle players and light strummers, though flatpickers are known to enjoy its tonal character too. Its intimate size makes it lap/couch-friendly, and a great fit for players who find smaller instruments more physically comfortable. Mahogany is a hardwood that produces a natural compression, yielding more "roll-in" effect to a note. The compression evens out a lively attack for a more linear response. Mahogany tops deliver strong fundamentals with clear and direct focus. Tonally, blackwood behaves somewhere in the middle of rosewood and mahogany, with a little extra shimmer and chime that shows its family resemblance to koa. Pairing blackwood with the mahogany top not only gives you that roll-in effect associated with a mahogany top - really smooth attack and balance - but extra complexity as the note decays. It's a great combination. Taylor's ES2 is a revolutionary pickup design that delivers the latest in Taylor’s ongoing innovation in acoustic guitar amplification. The heart of the Expression System 2 is Taylor’s patented behind-the-saddle pickup, which features three individually calibrated pickup sensors. Because the pickup doesn't sit under the saddle, the bottom of the saddle comes in full contact with the bridge, allowing all the nuance of the guitar's tone to come through clearly whether playing acoustically or plugged-in. The location of the sensors enables a more dynamic range of acoustic sound to be captured than ever before while playing plugged-in. 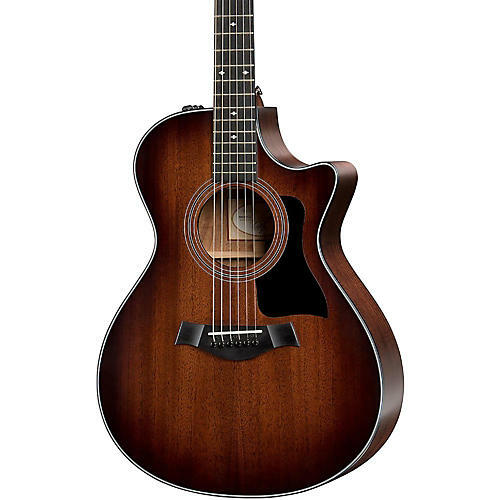 The Expression System 2 faithfully conveys the voice of your Taylor guitar.